2015 has been a great year for Jabu Mahlangu (formerly known as Jabu Pule). The much-loved soccer legend that dribbled himself into the hearts of many-a-South African put his reflexes to the test during the most recent Nissan Knockout Challenge. On the heels of signing soccer analyst and mentor deals worth R3.2-million a few months ago, Mahlangu continued his winning streak with Nissan. 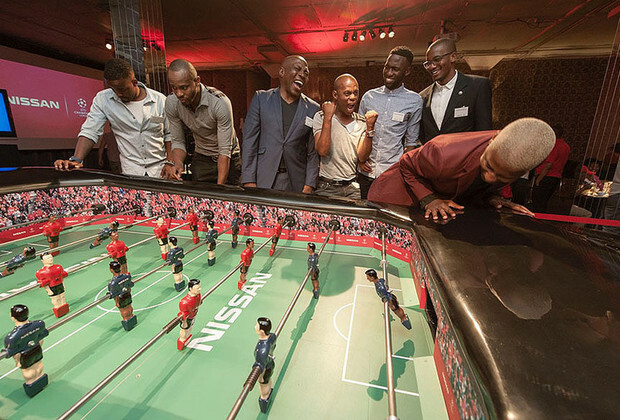 As the sponsors of the UEFA Champions League for the next four seasons (2014–2018), Nissan hosted the Knockout Challenge as an official reveal of their most exciting innovation to date: transforming their Qashqai into a drivable, ready-to-play fooseball table complete with two 11-aside teams. The stage was set for an epic showdown between soccer greats, sports personalities and celebrities to prove their skills on the miniature soccer table. The competitive climate was rising and under the watchful eye of Bafana Bafana coach Shakes Mashaba, the competition was down to Mahlangu and former PSL opponent, retired international soccer star Sibusiso Zuma. Fighting back from a two-point deficit and finally winning the game 5-2, Mahlangu walked away with the prize of a Nissan experience for the prescribed period. An elated Mahlangu was all smiles when he was handed over the keys to his new ride, a 2015 Nissan Qashqai. The Nissan Knockout event was also the official launch of the Nissan Knockout Roadshow, which will be taking place across the country until May 2016, where the modified Qashqai will be played in challenges across the country.